A True Irish Country Meal. A Casserole of Ground Steak with Fresh Vegetables topped with Smashed Irish Potatoes, Cheddar Cheese and baked to a Golden Brown. With real hand Mashed Potatoes (lumps and all), Homestyle Gravy & Country Green Beans. Served with Mashed Potatoes and Homemade Gravy, Collard Greens and Cornbread. 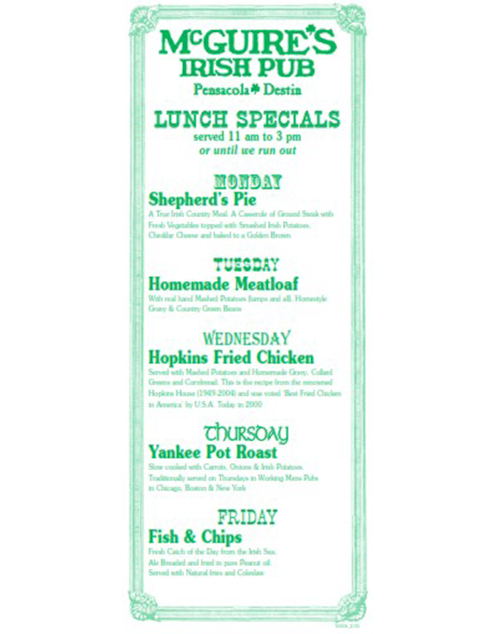 This is the recipe from the renowned Hopkins House (1949-2004) and was voted ‘Best Fried Chicken in America’ by U.S.A. Today in 2000. Slow cooked with Carrots, Onions & Irish Potatoes. Traditionally served on Thursdays in Working Mens Pubs in Chicago, Boston & New York. Fresh Catch of the Day from the Irish Sea, Ale Breaded and fried in pure Peanut oil. Served with Natural fries and Coleslaw.